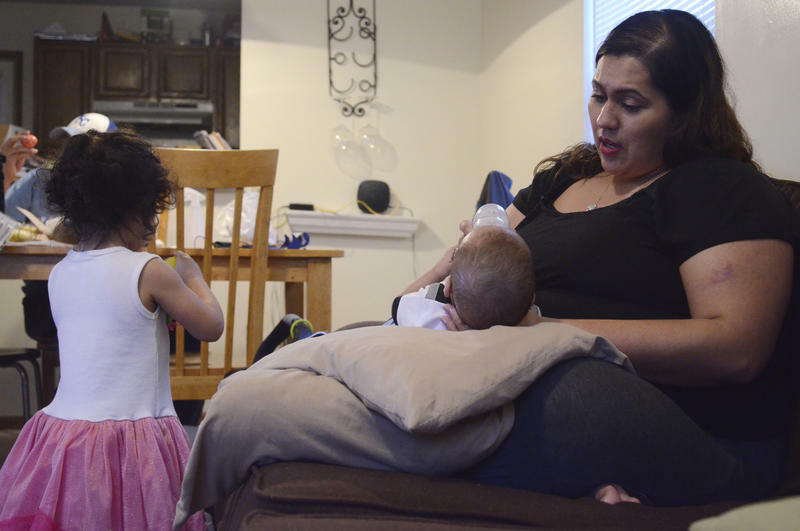 Lupe Ortiz feeds her 5-month-old son Jonah in her Columbia, Mo. home. Ortiz uses milk from multiple donors to supplement her own supply. 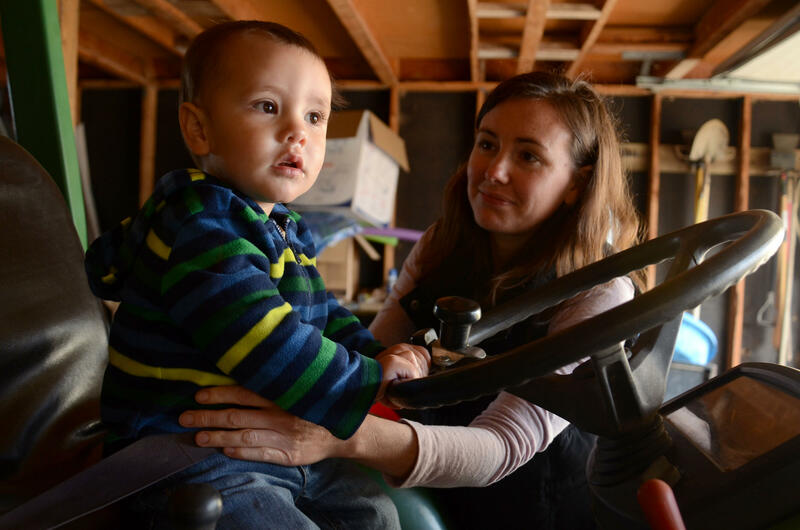 Danielle Geurts helps her 1-year-old son Emmett off a tractor at their Columbia, Mo. home. While nursing Emmett, Geurts donated her extra breast milk to Sarah Cranston after they both posted to the milk sharing facebook pag, "Human Milk 4 Human Babies." Sarah Cranston wipes her 15-month-old son's nose. Cranston fed her son with donated breast milk. Lupe Ortiz holds her son Jonah for thier evening breast milk feeding. Ortiz uses Facebook pages that connect breast milk donors to recipients. Jonah drinks donated breast milk while he's at daycare, and Ortiz's in the evening. When Sarah Cranston met Danielle Geurts, she had a lot of questions. She wanted to know about Geurts’ caffeine consumption, any medications she took, and her baby’s health. Cranston wanted to be sure Geurts’ breast milk was safe for her own 6-month-old son, Ian. Cranston and Geurts met on a Facebook page for mothers looking to either donate or receive breast milk. Women who use online pages, like these two moms, are developing ways to feel safe giving their children another woman’s milk. “There’s just so many different things you have to do to make sure it’s hygienic, because it’s never pasteurized or boiled or cooked because that destroys a lot of the nutritional value,” Cranston said. Cranston was not the only one with concerns. Geurts had reservations of her own. “I didn’t know if they were going to collect it and sell it, because I understand there’s some market for milk,” said Geurts. Although their first interaction was online, meeting each other helped develop their trust. “It seems like it would be easier if it were from someone you could meet face to face, instead of some random faceless person,” said Geurts. Geurts shared her breast milk with Cranston multiple times, and the two still keep in touch, but according to the Food and Drug Administration’s website, it does not recommend this approach. 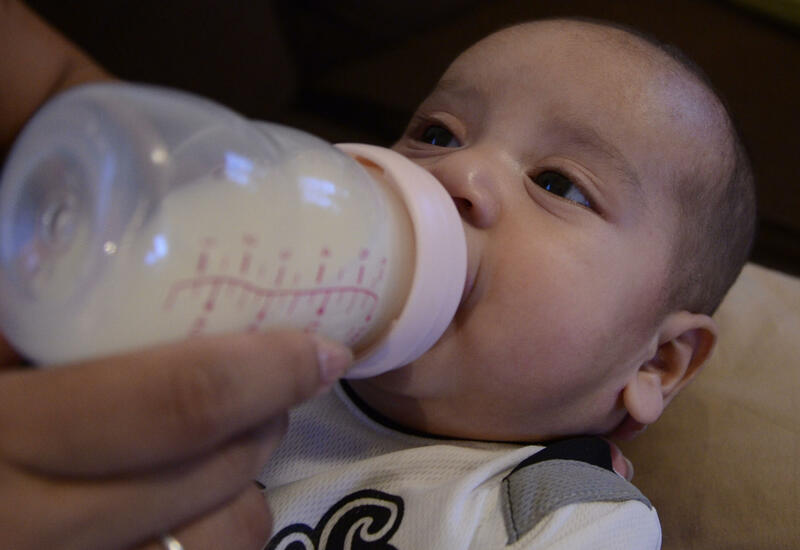 It warns giving infants milk from unscreened donors can put the child at risk. Marjorie Sable, Director of the University of Missouri School of Social Work and a researcher in maternal and child health, agrees. “The concerns I have about women getting their milk online from someone you don’t know are that you don’t know if they might have some kind of disease that could be transmitted through breast milk, and an example of that is the HIV virus,” Sable said. Milk banks are agencies that test, process and deliver donated milk primarily for premature babies in the neonatal intensive care unit. Donors are extensively screened before their milk is accepted. Donors have to go through an initial screening for diseases like hepatitis. If they pass, they go into the hospital for a blood test. They’re asked to bring in some breast milk for pre-screening as well. Mothers like Cranston don’t have the advantage of extensive screenings. She recognizes the risks of online milk sharing, but she is confident in her process. “Once you trust somebody, you might as well stick with them as long as they have enough milk and are willing to keep donating,” said Cranston.